Thanks a lot, coaches corner. I was feeling super happy and now I'm teared up. So, I watched the second half of the Pistons game. I need this game to bleach that memory away. Way to bleed for us, Glennie. Let's make it worth the blood he spilled. Sens penalty with 30 seconds remaining on the other penalty. Short 5-on-3. Pretty cheap call, but let's get some. Our power play will be the death of me. Can we get Salajko to run our PP? Seems like our goalie touches the puck more than anyone else. Keep selling the dream, Kenny. End of 2nd. 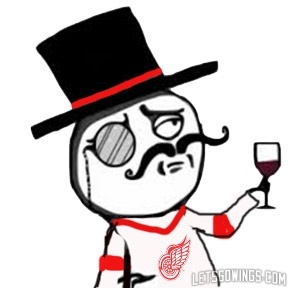 Wings lead 2-0. Game is putting me to sleep. Lordy. That period full of penalties wrecked Ehn's big night, only logged 2:57 in the 2nd, which is close to average for him. AA, on the other hand, carrying the weight at 7:51 for the period. Time to see which teams legs run out first, and wait for the trainwreck to happen. Abby stopped on a partial breakaway. I hate to say it, but I saw better passing today at my Grandson's game, and he's in his first year of Pee-Wee. I read that as "Grandmother's" and that provided me with more entertainment than this whole game has. I was hoping this game would help me forget the Pistons game, but it's just putting me to sleep. Give the Sens the goal. Make it interesting. The old "Intent to blow" goes in our favor? That last angle from the goal line, looked like it was sitting out in front of his pads. I think we got away with one there. It's a conspiracy. The league wants the Avs to get Hughes. What was the point of that, Glennie. Skate it out.